It’s just so great to keep in touch with an old friend. 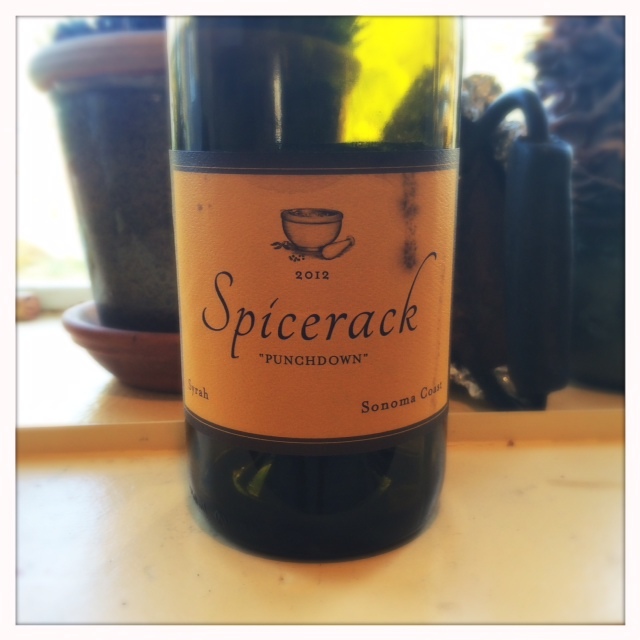 I try to get a hold of a Spicerack “Punchdown” Syrah in every vintage. It’s one of the first cool-climate California Syrahs that I tried and I love it so. Back when I was transitioning from bigger, richer wines to more elegant ones, the Spicerack (along with the Eaglepoint Ranch Syrah) had this zing of acidity and a sort of crunchiness that really turned me on. These wines were a direct contrast to the big Shirazes that I’d had from Australia—wines that I had liked initially but had grown tired of. The Spicerack was just the change of pace I needed and it began a love affair with cool-climate Syrah that is obviously raging on to this day. The Spicerack is the project of Jonathan and Susan Pey who also make the Pey-Marin Pinots and the delicious and well-priced Forager Pinot. All their wines are made in a minimalist style, with the utmost attention given to the fruit in the vineyards. Salty black olive and high toned aromas of lavender dominate this wine, with hints of meat and insect (yes, I know #keepsyrahweird) in the background. On the palate there’s a richness and fullness that belies it’s cool-climate tendencies and, in fact, there is some warmer climate fruit in there from the Alegria Vineyard in Santa Rosa. But it’s still full of great acidity and, like past vintages, kind of a crunchy mid-palate which probably comes from cooler Syrah vineyard in the Carneros region of Sonoma. The finish has just enough tannin to be balanced for drinking now. It’s a beautiful wine and one that I’m happy to revisit. It’s the perfect choice to introduce people to cool-climate Syrah but it also has the complexity to pique the interest of the true Syrah aficionado. And its acidity and tannin will allow it to age for quite a while. The wine only sees about 10% new oak which in my opinion let’s the fruit and savory aromas really shine through. Like seeing an old friend, it was really a pleasure to spend some time with the Spicerack and I’m glad to see it’s still doing so well. Just as I remember it, this is a wine that’s the best ambassador for California cool-climate Syrah.